The seat of Polish kings 1,000 years ago, Poznan has a rich history that repays exploring with a guide. On this private walking tour, check off the city’s historic highlights, from the 16th-century mechanical clock with its head-butting goats to the Imperial Castle, from the Cathedral of St. Peter and Paul to the June 1956 Events Monument. 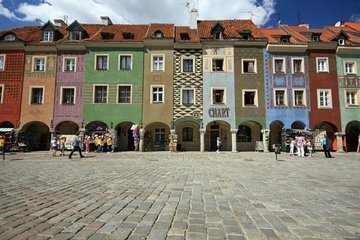 We are very happy that we took this walking tour of Poznań and we recommend it to other couples and groups that are interested in history and architecture. Our guide, Ola, was fantastic ~ she was knowledgeable, fun and charming ~ just the type of guide one wants. She told us about how Poznań has significant history stretching from sometime before the 10th c. AD and continuing through the end of the Soviet era in the late 20th c. In addition, since she is from Poznań, she was also able to tell us about everyday life. Go to Poznań, take this tour, and if you're lucky you'll have Ola as your guide.